Smith & Wesson has recently started ramping up production of their licensed airsoft products lately, and one of their newest guns is the M&P 9C, manufactured by VFC. This compact GBB pistol is an impressively accurate replica of the real steel S&W M&P 9C, and it packs in some interesting features not present on similar GBB pistols on the market. Keep reading for more information on the M&P! 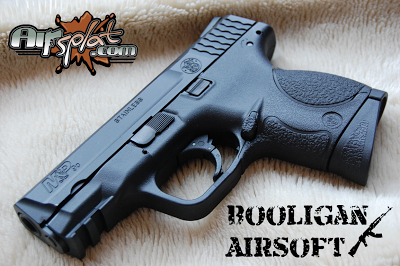 I received this gun though Airsplat who has it available HERE priced at $139.99 at the time of this review. It's a little bit higher priced compared to other GBB pistols, however, you must remember that this one is legally licensed through S&W and manufactured by VFC, so it carries a higher price. The price qualifies it for Airsplat's free shipping for all orders over $89, as well as their return/refund policy which is pretty great these days. 15 day return with a refund, or 60 day return for exchange. The S&W M&P 9C is the compact version of the M&P pistol, which is a very popular model with law enforcement and civilian shooters throughout the world. It's a polymer framed pistol that is designed for ambidextrous use by shooters of all hand sizes. S&W did a great job designing the real pistol, and VFC did an excellent job replicating it. The VFC is unique in that it has a special, partially hidden full auto feature, adding to the fun that this gun can provide! I was surprised with the simple packaging of the M&P, as it consisted of a simple cardboard container with a sticker showing a few drawings of the gun. Inside the box, an angled cardboard insert keeps the gun relatively centered. I don't see it causing an issue with shipping or anything like that. When I pulled it out of the box, I was REALLY pleased with the trademarks, as they were the first thing that caught my eye. In addition to the gun itself, VFC includes a total of three interchangeable backstraps, a serial number plate and fake night sight inserts which you install yourself, a manual, and a small black plastic piece which I can't figure out the purpose of. If anyone can figure it out, let me know! The M&P 9C is a "full metal" replica in that it has the same metal content as the real gun that it is replicating. The frame is a nicely textured polymer with interchangeable rubber backstraps, and the barrel and slide are made of metal, just like the real gun. The coloring and feel of the pistol are both great, however, the paint finish on the slide is easily scratched. The grip on any gun is incredibly important, and on a pistol is doubly so as it's the only part of the gun that you hold onto. Thankfully, VFC did a great job replicating the incredibly comfortable grip from the real gun, including the interchangeable backstrap system. To swap out the rubber backstraps, you just need to rotate the plug at the rear of the magwell 90 degrees and pull it out. You can then pull out the existing backstrap and replace it with one of the other units that fits your hand better. The grip length is short and really needs the magazine extension to get all of your fingers solidly on the grip. The controls of the M&P are largely ambidextrous, including slide catches on both sides of the gun and a magazine release button that can be swapped to either side. The gun does replicate the safety trigger from the real gun, however, the angled piece on the trigger that catches on the frame when pulled incorrectly is a little longer than it needs to be, and can rarely feel scratchy against the frame when pulling the trigger in certain ways. Otherwise, the trigger pull is nice and light, however, the WE Toucan has a lighter pull. The magazine release button has texturing matching the front and backstraps, and makes it very easy to manipulate. The front of the frame has a short 20mm rail for mounting lights, lasers, or other accessories. You may have issues finding rail mounted accessories that will fit, due to the short rail length. The metal slide looks and feels great, with a satin black finish and gorgeous trademarks. It has a pretty smooth pull, with a slight hang up when it hits the barrel, but it seems to be getting much smoother with time and use. There are scalloped serrations at the rear of the slide to assist with cocking the gun. The paint finish looks good now, but it's already showing some slight wear towards the front. The outer barrel is made of metal and is realistically slightly flared towards the muzzle. The orange tip is a plastic plug that is screwed into the barrel, making it easy to remove as desired. Unfortunately, the outer barrel's inner threading is reversed, so you can't use most threaded barrel adapters. This would look great with a can on the front, and I've yet to find an adapter that will work. The real M&P comes with tritium night sights, and the VFC comes with inserts that cosmetically resemble night sights, but unfortunately, do not function. They are high contrast black and white dots, so they are very quick to acquire, but they don't glow in the dark or anything like that. S&W gave VFC permission to apply trademarks to the M&P, and they went nuts applying them to nearly every surface of the gun. That being said, the trademarks are realistic as to the design and placement on the gun, so it's not a bad thing at all. They did a really good job with it, and the gun looks incredibly realistic. You'll find markings on the slide, frame and magazine baseplate. The included metal magazine holds 14 6mm BBs as well as your gas of choice. The magazine has a slightly textured finish to it which made "free dropping" the magazine impossible at first, so you'll need to break it in for a little bit before it'll fall free when you push the button. The magazine is easily loaded by pulling down the follower down and placing the BBs in the front of the magazine, ensuring that they properly stagger on the way in. Range and accuracy were okay for a compact sized pistol, but not groundbreaking in any way. I was comfortable putting shots on a torso sized target out to 90' and get 90% of my hits on target, but after that, the rounds seemed to run out of steam and started peeling off target from side to side. I'd put maximum range out to 120' or so, but realistically, you're most likely not going to hit your target at that range. Rate of fire when in full auto mode is pretty good for a GBB pistol, coming in around 13-14 RPS. Yes, this means you'll drain your whole magazine in about one second. Yes, that's fun to do! Gas economy was about what I expected, coming in at around 30 rounds per gas fill, so you're getting 2 BB loads out of each gas load. During my testing, I did have the occasional failure to lock the slide back on empty on that second mag load of BBs, but that was generally if I was firing rapidly during the testing. Disassembly of the M&P is a very simple process, which you can see in my video at the top of this review. You simply have to remove the magazine, pull the slide back and flip the disassembly lever, which will allow you to remove the slide off the front of the frame. Once opened up, you can access the hop-up to adjust it, clean and lubricate the internals, and fix or replace broken components in the off chance something breaks. Inside the slide, you'll find the blowback assembly which is largely made of plastic and slides smoothly on the inner rails. The barrel assembly is easily removed and features a brass inner barrel with an O-ring installed on the end to keep it centered in the outer barrel. The recoil spring has enough power to make the slide return snappy, and the hop-up features a dual prong nub for improved accuracy. The full-auto feature of this gun is accessed by pulling the slide back and flipping the little metal nub located on the bottom of the slide, on the right side. This is a bit of a pain, as you basically have to do it with the gun unloaded or you'll chamber another round. Inside the frame, you'll find that the internal components are largely made of metal. The hammer/striker assembly is a very simple design, without the ball bearing system that the WE uses. Unfortunately, this means you need to be extra vigilant in keeping these components well lubricated. As it sits, there aren't many modifications that you can do to this gun, however, there are plenty of accessories that will work, given that it's so close to the real steel pistol. I've fit it in my real steel carry holster that's designed for the full size M&P, however, it's a leather holster, so it's a little more flexible than most. The front rail is short, so finding lights or lasers will be tricky. One question that people have asked is about cross compatibility with the WE model. I'm sad to report that there is zero cross compatibility between the two, due to several differences in the actual design and construction of the guns. I'm a big fan of S&W pistols, and my EDC is an SD40, so I really like having the chance to test out the various S&W replicas on the market. The full size model is a better training tool for me, as it's closest in size and shape to the SD40, but for skirmish/sidearm use, I'd go with the VFC. The smaller size fits better in my hand, and the full auto feature, while incredibly unrealistic, is a nice touch and makes me smile every time I pull the trigger. I'm excited to see what other GBB pistols VFC comes out with, especially if they're half as good as this little gun!